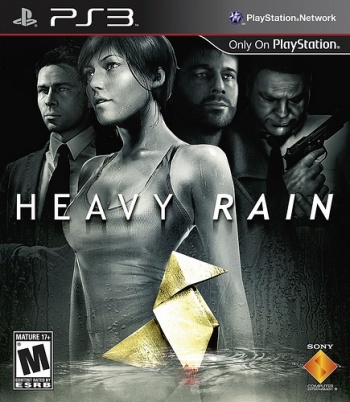 Once again, the box art we get in America is a marked downgrade compared to the version everyone else gets - just look at Heavy Rain. Yesterday, Sony revealed the official box art for upcoming action-quicktime-what-are-we-calling-this-again Heavy Rain - the US version, that is (as seen to the right here). The EU box art also surfaced on the 'net, and a direct comparison between the two finds the US one to be a bit... lacking. There's something very poignant about the understated box that our friends across the pond are getting - it's a bloodied origami crane (the mark of the Origami Killer) lying in the puddles created by the eponymous heavy rain. In comparison, the US box art takes the same image and shrinks it down to superimpose on the images of the game's four protagonists. It's a bit busier than the original, and a lot less aesthetically pleasing (and I don't get why - of all things - they opted to change the logo to something less interesting). My question is - why? The net result is something that wouldn't feel out of place in Left 4 Dead (three guys, one girl, guns - all you're missing is the zombies) like for instance, the art for the Hard Rain campaign. I understand that not all gamers obsessively read up on upcoming titles, and that publishers understandably want box art that grabs someone who may never have heard the game before but who sees it on the shelves at a store. But is a more "action-y" title always the way to go? On the plus side, there's a silver lining - Sony will be offering a pre-formatted .pdf of the EU art to print out and use as an alternate box art for those of you who pick the depressing game up and prefer the subtle Origami Killer version. So I guess everyone wins after all.